But it’s not spirits. It’s not even beer or wine, and yet it is 28 proof. 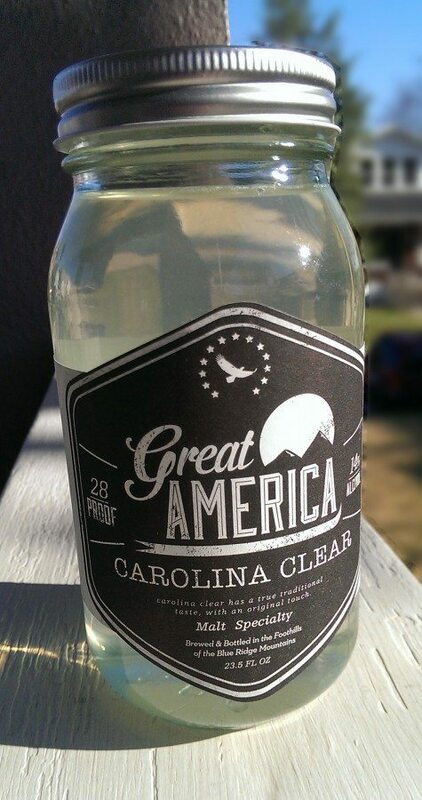 I stumbled on Great America “Carolina Clear” at a gas station in Bardstown, Kentucky, of all places. It was just a couple miles from Jim Beam and Four Roses. I would have assumed the heart of Bourbon Country is roughly the last place for a product such as this to thrive. And yet, the guy loitering and smoking out front advised it is an excellent product and will get one messed up almost as good as the illegal stuff. The display had about 40 jars of the product, in various flavors, a couple days ago. When I went back today, only one jar was left. And so, if it’s not beer, wine or spirits — what could it possibly be? It took me a few minutes, and a return trip, to sort it out, because this is indeed an unusual product. 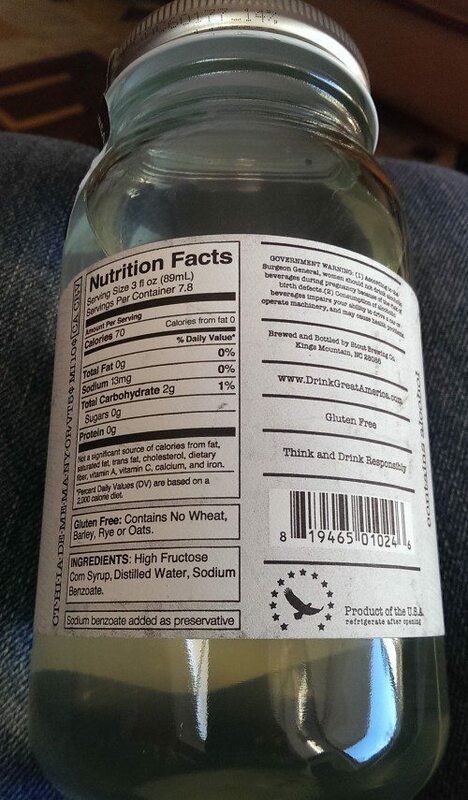 The back label explains, in the FDA-style ingredient list, that the product only has three ingredients. I don’t think anyone will be surprised, at least at this point, that those ingredients are not the ones elevated in the Reinheitsgebot (the German Beer Purity Law of 1487, allowing beer to be made with water, barley and hops only). The North Carolina-made “malt speci alty,” selling for $5.99 a jar, is made only with high fructose corn syrup, distilled water, and sodium benzoate. It is tough to imagine an alcohol beverage that could be produced at lower cost. TTB would have required a label approval. I see one label approval for this company, but none that match this product. TTB might have eventually said it looks too much like a spirits product, and might have required a clearer and more prominent statement of identity on the front label. The product seems to do a decent job of complying with the FDA food labeling rules (as opposed to the somewhat different TTB labeling rules). The serving size, however, at 3 ounces, seems very small (and the 7.8 servings per container seems absurdly large). This Joose-brand flavored malt beverage has a similar net contents and alcohol content, and yet is sold in single-serve cans. Notwithstanding these distinctions, the federal taxes and permit requirements would be the same for this product as compared to typical beer. 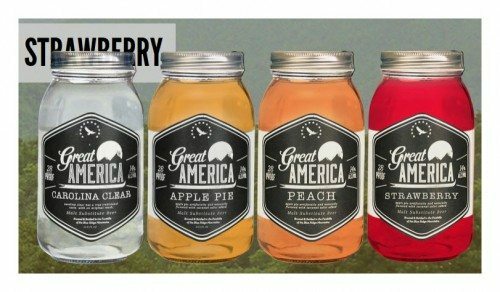 This product is put out by Stout Brewing Company and also comes in common moonshine flavors such as peach, apple pie, and strawberry. 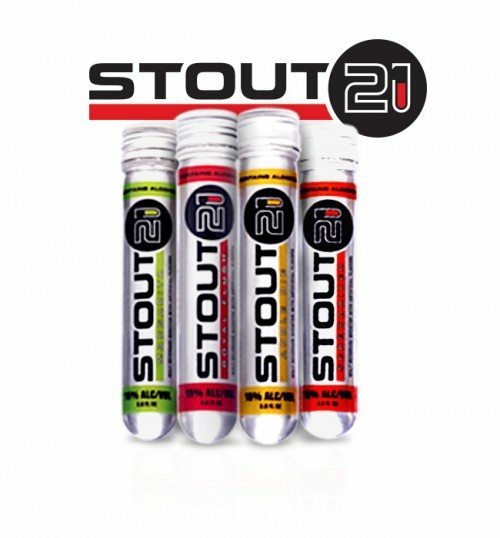 Stout also markets similar products in 3 ounce tubes (as in the image immediately above). Filed Under: alcohol beverages generally Tagged With: fda, hybrid, policy, would you drink it? I did the math for you. The actual serving size should be 4.3oz, so you actually get about 5.5 servings per container. This is based on alcohol content of course. They probably decrease the serving sizes just to make the calories seem less. Alcoholic beverages rarely contain nutrition facts, so they don’t have to hide the calories in small serving sizes like food manufacturers. Basically at $5 or $6 per bottle, and this being equivalent to about 5 or 6 macro beers, this is a darn good deal. Whelp i had a try of the Carolina Clear and it was purty dang good but not what I thought it was! I will still buy it though, so that say something! 5 bucks is a real good deal! I will definitely try the other flavors! Can you remember where you got it from. I have asked the company and they keep giving me places that sell it. Then I call them and ask and they say we don’t sell it. Does the Apple pie one have persimmons in it?? I have been told you are Not making the peach or any other flavor except lemonade or is their way of not buying from you. Peach is very good, especially is punch. Please favor me with an answer. The apple pie is awesome. I just got the peach tonight to try it out. Nice buzz. Nice price. Enough said. And yes, the label caught my eye. Also the jar is awesome. I use them after i drink the “moonshine.” hahaha. Love this beverage… like moonshine at Dollar store prices!!!! Keep up the good work and flavors. Glad I found it!! !